My mom’s grandma, aka Grandma Graham, always made the perfect pie crusts from scratch. It’s a simple recipe, though slightly different from others you’ll see because it contains an egg and some vinegar. I’ve tweaked the recipe a bit by swapping out 1/4 of the lard for butter, this adds extra flavor to the final pastry. You can swap out up to half the butter, but make sure you use at least half lard because it provides the perfect flakiness. 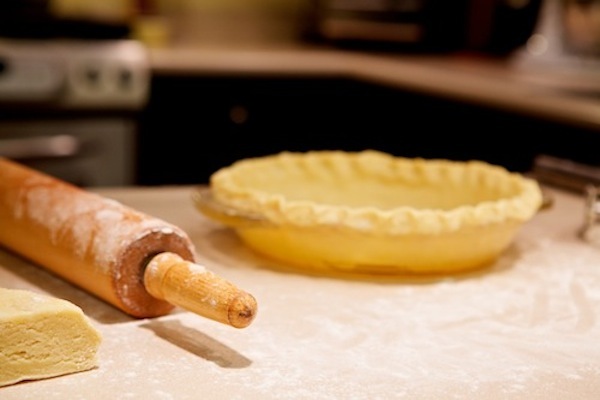 Making pie crust isn’t as difficult as some people make it out to be, it’s actually pretty basic. I attribute the fear surrounding to some of the cooking shows I’ve seen where they make it out to be some mystical thing where you have to have the perfect balance of fats and temperature or you won’t succeed. Another one of the reasons pastry crusts have a bad reputation is the move away from lard to other kinds of fats, like shortening. There’s a reason our great grandmother’s used lard in pastry crusts, it’s not as finicky as shortening. Taking the time to source pastured lard will make the end product so much better. Do not buy the hydrogenated lard from the grocery store, head over to your local butcher shop, or on-line to find a source for pastured lard. If you know a small local farmer that raises hogs, you should be able to contact them for leaf lard, which is the best kind of lard for pastry. EatWild.com is a great resource for finding local pasture based farmers as is your local farmers’ market. I have purchased leaf lard from Tender Grass Farm before, they don’t always have it in stock but you can have them put you on a list for when they do. Sift together flour, salt, and sugar in large bowl. Mix in lard with a pastry blender or fingers until mixture is crumbly. Make well in center, add beaten egg, vinegar and most of the cold water. Mix until ingredients form a ball, knead a few times to bring together. Divide into 4 pieces. If dough is too warm, put fridge to chill. Dough will be easiest to roll out when it’s not too cold or too hot. Flour counter, roll into desired thickness and size for pie plate. *I wouldn’t recommend swapping out the white flour with whole wheat, believe me, I’ve done it and when you’re eating it you feel like you have sand in your throat. As with any recipe you make, the higher quality your ingredients the better your final dish will taste; using organic local or King Arthur Flour, organic pastured lard and butter, pastured eggs, real sea salt will make your pie crust taste even better! For a video how-to on making this recipe head on over to the Your Day Blog to watch. When it comes to pie do you prefer å la mode or sans ice cream? Didn’t hear it, will look on-line. I love that more info is coming out on how healthy lard, butter, tallow, and coconut oil are. Congrats on the new blog! Looking forward to all you have to share here. Im looking forward to trying out your grandma’s pie crust.. Sounds like a keeper & it looks beautiful as well as easy to handle. Love that! A definite thumbs up for new foodie blog 🙂 I like to eat my pie with cream….maybe thats cause I’m a Brit! lol. Mr Chiots must have some British blood in him too, he’ll always choose ice cream if available! I love what you chose for your blogs name! I can make the most difficult of bread recipes, but have never been able to roll out a pie crust…I’ll give this a try with the video going and maybe I’ll have success ~ I’ll let you know. Favorite pie: Pumpkin. A la mode: Never. Thanks, I spent a long time deliberating the name, trying to find a matching domain, etc. My Grandma still makes here pie crusts by mixing everything with 2 butter knives. I have a pastry blender like yours. Thanks Andrea – appreciate you being the first comment – how fitting! I occasionally use two knives too, but I much prefer using my fingers or the pastry cutter! You may have been, I had to approve the comments since everyone is technically a new commenter over here. Not sure how that affects the time they come in. Will have to try this once I find some lard. I’ll check with the farmer I buy my beef from. Strawberry rhubarb is our favorite! aaah, to put up the first post and have THIS many comments already… LOL congrats, this looks great & i’ve just bookmarked it. You crack me up – so thankful that we met and can share a love of good food! I do have a good readership base already to draw on. I just signed up for a pork CSA. I hope there’s some leaf lard included in the delivery! My favorite pie is a sour cherry pie. Make sure you ask – that was the first think I asked when I was looking into buying half a hog! Beautiful job Susy. LOVE IT!!! Oh, I’m sorry. I didn’t know pie could be served sans ice cream. Man, I am already learning things from this blog! You and Mr Chiots would get along famously! Love the new blog! 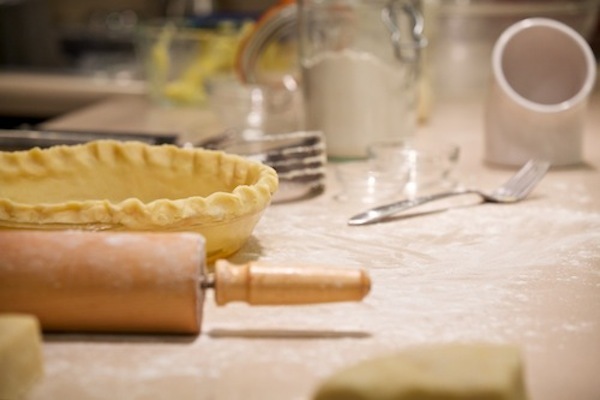 The recipe looks great too- I love making my own pie crust. Store bought tastes gross after you make your own for awhile! Congrats on the new blog – I love reading Chiot’s Run and I’m sure the new blog will be great too! My favorite pie crust also uses vinegar (my mom taught me the trick growing up) – it makes a much flakier pie crust than any other recipe I’ve tried. Love the new site, the name, the look, the whole feeling. Yay! I do not like ice cream with my pie, but in general I am not a big cream person – leaves more for my husband who is very much, though. Thank you for the pie recipe, I will use this crust for next pie I make. This excites me… mainly because the recipe I currently use DOES call for shortening… I hope I can find lard nearby. Would love to give this recipe a try! And I adore the photo of the recipe card, it’s such a great thing to have an old relic like that and to share it’s knowledge for generations. I’m excited to see this blog come out! 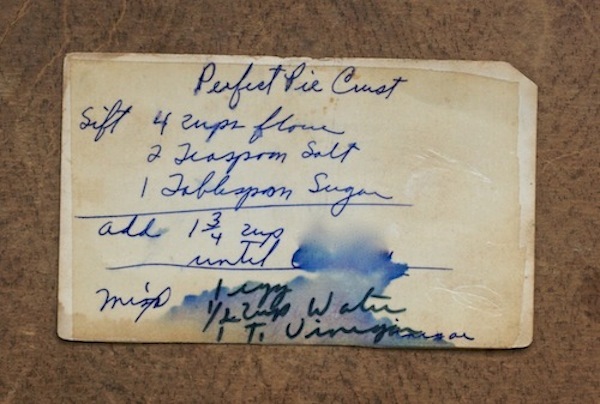 I love the photo of the recipe card because that is how a lot of mine heirloom recipes look. My Mom doesn’t use lard or butter in her pie crusts though. Congratulations on the new blog. I have been pondering on something similar for about 3 years! I’m with you on the lard for your pie pastry – makes such a difference. That’s the best way to get your lard/tallow is by purchased whole/half/quarter animal. Since I am new to the whole pick your own cow/pig and lard making, do you have any advice or a web site you frequent? My best advice is to find a local farmer’s market or a local farm that raises the kind of meat you want. You should be able to get a few pounds of meat to try before ordering a whole/half/quarter animal. Local Harvest or Eat Wild are also great places to find sources of pastured meat near you. Thank you, Suzy…My crusts always crumbled before, and didn’t stick together…. Yours works!